Comments: On June 9, 1861 the Secretary of War authorized a U.S. Sanitary Commission, which was approved by Lincoln on June 13, 1861. The commission promoted the health and general comfort of the troops through public contributions. In order to raise money for the commission numerous "Sanitary Fairs" were held, with the first in Chicago in 1863. 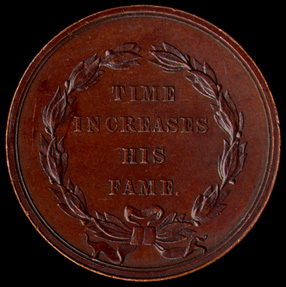 Several of the fairs produced stamps or medals to increase their profits, with at least four fairs producing Washington medals. 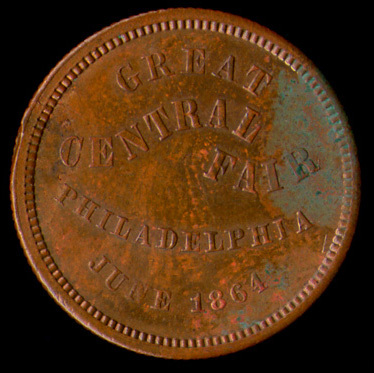 The medal shown here is from the Great Central Fair of Philadelphia, held June 7-28, 1864. 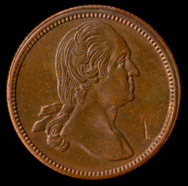 The Washington tokens were struck on a coining press located on the fairgrounds. Copper examples were sold for ten cents and silver examples were fifty cents each; there were also some copper gilt examples. G. and M. Fuld include a small photograph of the press taken during the fair in their work on Civil War storecards as cited below. Reverse: TIME / INCREASES / HIS / FAME. Comments: This medal was struck at the U.S. mint in Philadelphia during the period 1860-1865. The obverse die was engraved by William Kneass, chief engraver from 1824 through his death in 1840. The reverse die was produced at the mint about 1860. During the war years examples of this medal were issued in silver, copper, red bronze, aluminum and yellow bronze. Copper examples continued to be struck from ca. 1860-1880 and yellow bronze restrikes are still available at the mint. About a dozen special order examples were produced in gold between 1860 and 1900. 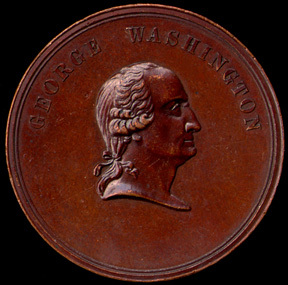 The medal shows an undraped bust right portrait of Washington on the obverse, while on the reverse is the legend in an olive branch wreath that had been tied with a bow at the bottom. The obverse die apparently had been unused for some twenty years when it was paired with a newly made reverse to produce this Washington medals issued by the U.S. mint. References: Rulau and Fuld, p. 65; Baker, p. 56.